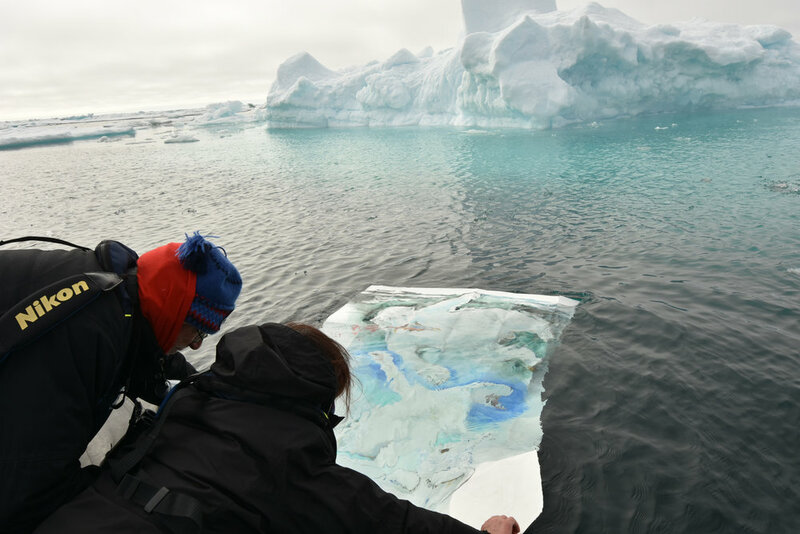 In summer 2015, my 5 ft. x 8 ft. watercolor painting of 3 polar bears traveled with Adventure Canada's staff Explorer Milbry Polk on their Greenland & Wild Labrador Expedition, sailing along the coast of Baffin Island, crossing the Davis Strait, and continuing on Western Greenland. 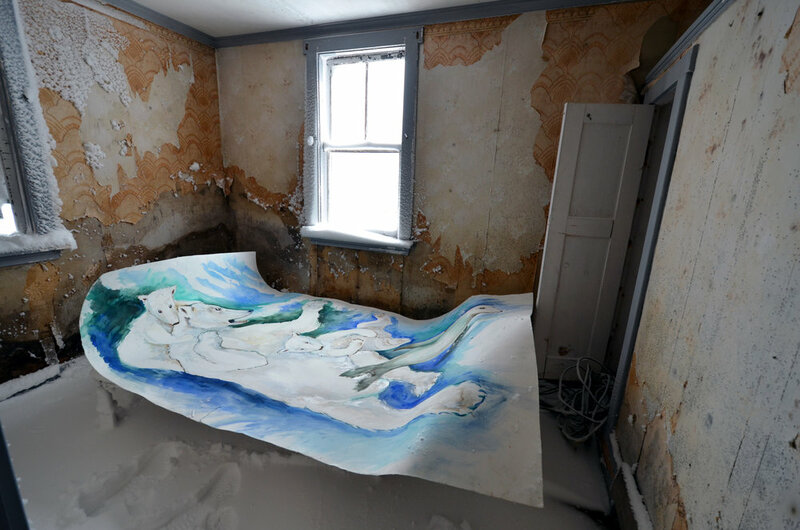 I paint these bears as an effigy, an offering-- a replacement for real polar bears who drown at sea looking for icebergs and sea ice from which to hunt and rest. 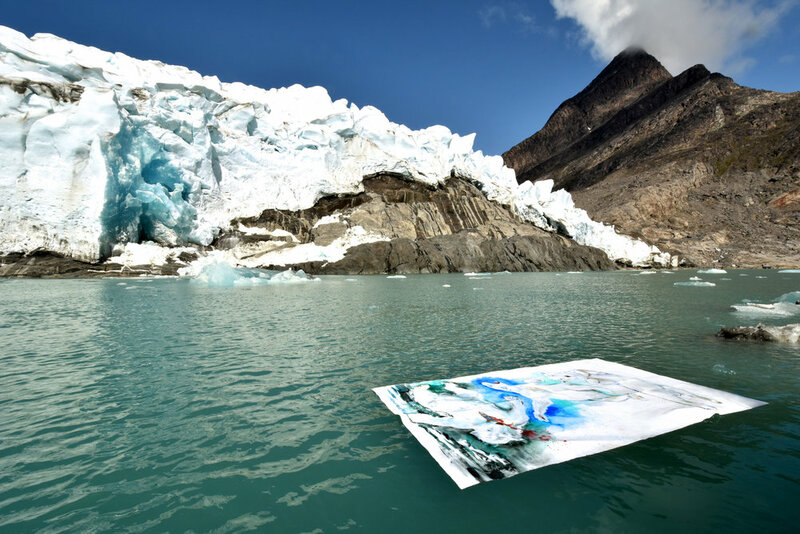 A second installation in Sondre Stromfjord was directly in front of the face of a glacier; after the shoot, the team raced away from the 20 ft. tall shard of ice as it fell from the face they photographed beyond the painting. (This time, more than symbolic...). 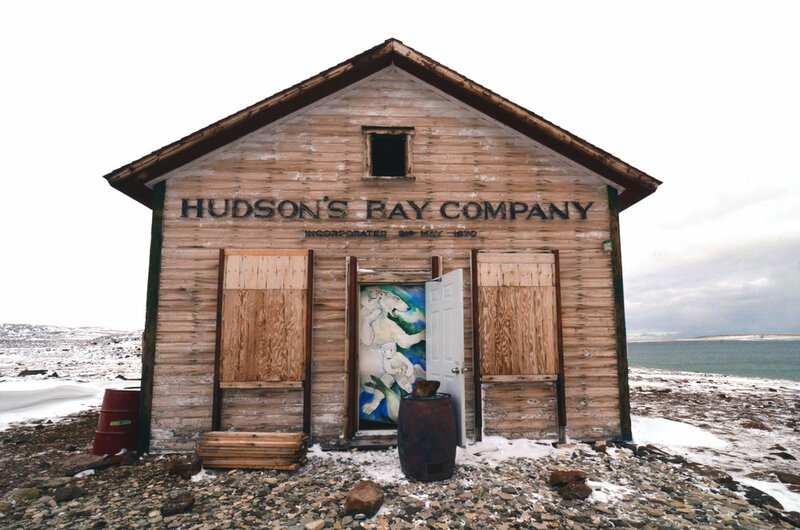 Thank you so much to Milbry Polk, photographer Lisa Young and the team from Adventure Canada! This and other painitings of mine will be on display at The Explorer's Club in New York City in November 2015. 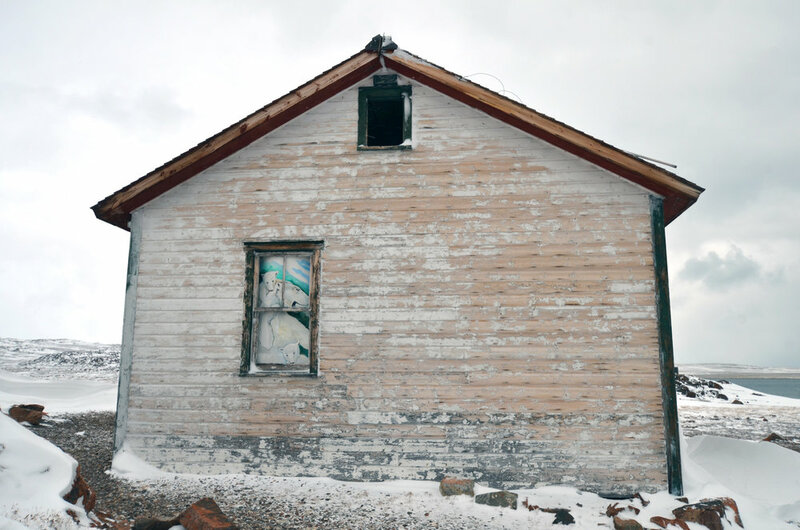 The Chasing of the Light Expedition sailed from Aasiaat, Greenland to follow the same route of the 1869 Arctic expedition of Romantic painter/explorer William Bradford. 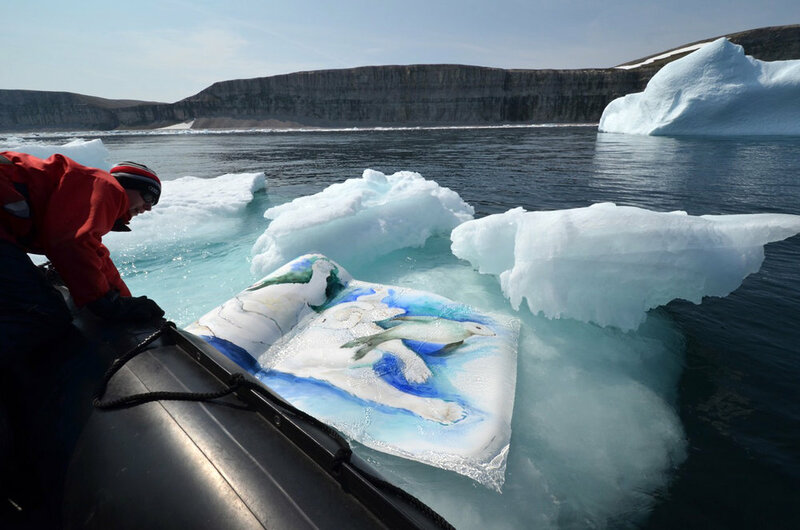 The expedition carried the expedition flags of the Royal Canadian Geographic Society, The Explorer's Club and traveled in association with New Bedford Whaling Museum. 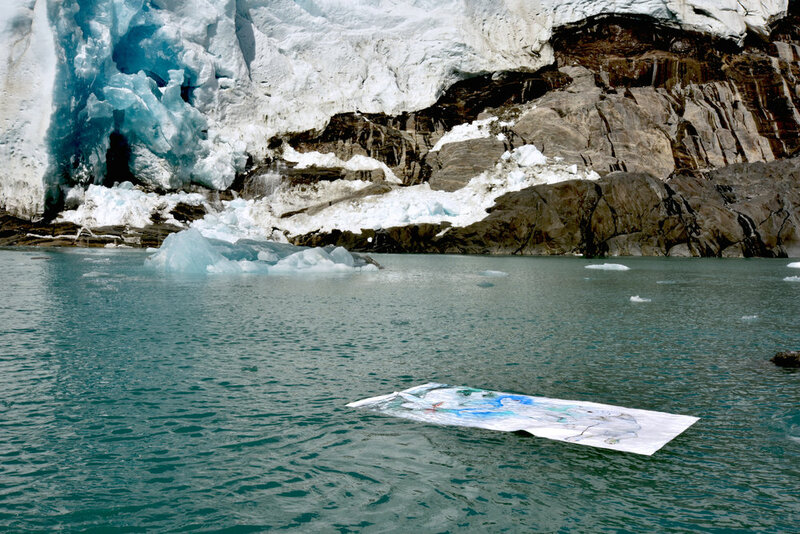 Several of my artworks were transported, deployed in the Arctic landscape, and photographed on beaches and in glacial waters as an experimental collaboration between me and other members of the Expedition. 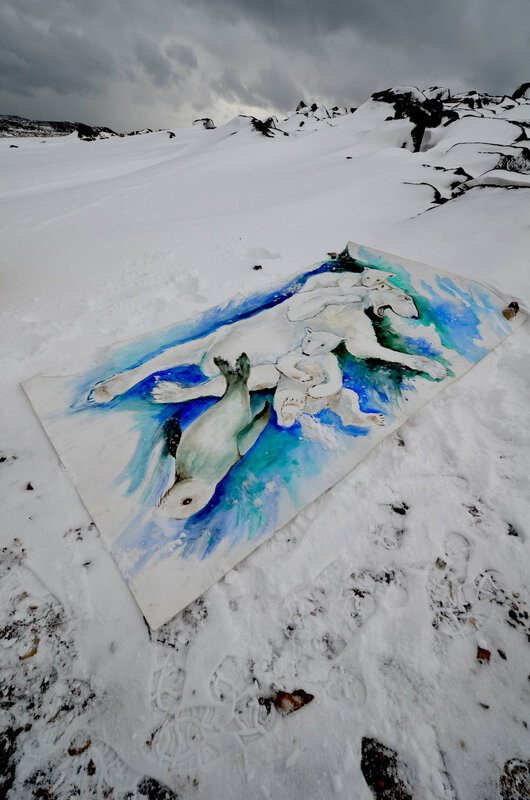 I provided a 4 ft by 9 ft watercolor painting of 3 polar bears which was floated by the expedition artists and explorer/author Milbry Polk into front waters of the IIulissat Glacier in Disko Bay, Greenland. 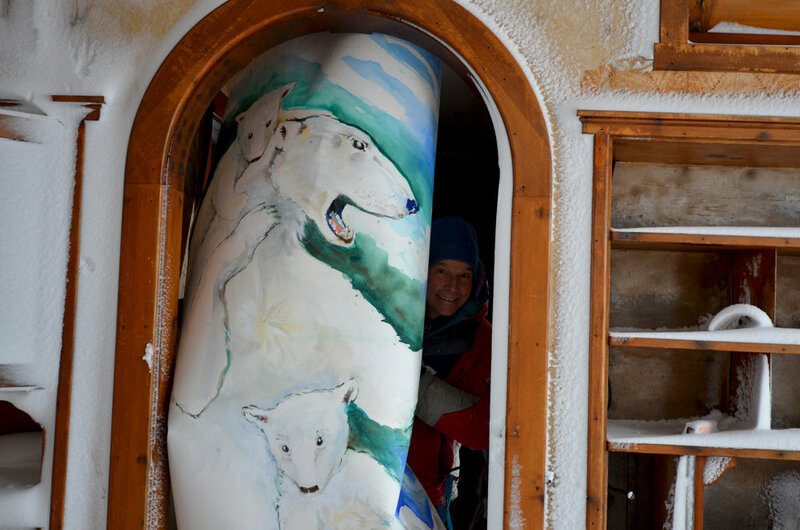 I offered these painted "effigies" or polar bears to "substitute" & "protect" actual polar bears.